The Inca City of Machu Picchu was built in the middle of a cloud forest, around the 15th century. This ancient Inca city houses some of the most incredible structures that exist such as the Temple of the 3 Windows, the Intihuatana, the Temple of the Sun or the Temple of the Moon. This last Inca enclosure is known as the ‘hidden jewel of Machu Picchu’. Where is the Temple of the Moon? Who gave the name to the Temple of the Moon? How to get to the Temple of the Moon? What are the hours of visit to the Temple of the Moon? The Temple of the Moon is in the mountain Huayna Picchu. Even today you do not have a clear idea of ​​what this construction was. It is another of the great mysteries of Machu Picchu. The Great Cavern (popularly called ‘Temple of the Moon’) is one of the most incredible buildings within Machu Picchu. It is built inside a natural cave. It has finely carved lithic structures. The Incas had an admiration for the caves because they believed that they could connect them with the world of the dead. In the center of the Temple of the Moon there is a surface like a throne. Some researchers suggest that sacrifices could be made there. No One has an exact idea of what the Moon Temple was. The only way to visit the Temple of the Moon is by buying the entrance Machu Picchu + Huayna Picchu. The Temple of the Moon is located below the top of the Huayna Picchu mountain, at 2,720 meters above sea level. From the Inca City of Machu Picchu you must climb the north side of the mountain to reach this place. The Temple of the Moon is inside a natural cave. The name of ‘The Great Cavern’ was given by the American explorer Hiram Bingham during the discovery of Machu Picchu. Over the years, the name of ‘Temple of the Moon’ was gaining popularity among archaeologists, tour guides and visitors. There is no relationship between the name ‘Temple of the Moon’ and this Inca construction. The name could be a commercial idea created by the settlers. You can only get to the Temple of the Moon with the ticket Machu Picchu + Huayna Picchu. To get there you must go through the so-called ‘Stairs of the death of Huayna Picchu’ and cross a small path to reach the Temple of the Moon. During The descent of the summit you will find 2 notices. One points to the direction of return to Machu Picchu. The other, the route to follow to get to ‘ The Great Cavern ‘. Visiting the Temple of the Moon will take you 1 hour on average after being at the top of Huayna Picchu. The hike to the Moon Temple is breathtaking. They cross the stairs of death and other trails next to huge cliffs. To climb to The Great Cavern You must follow a moderate-difficult hiking route..
Name: The Great Cave (Temple of the Moon). 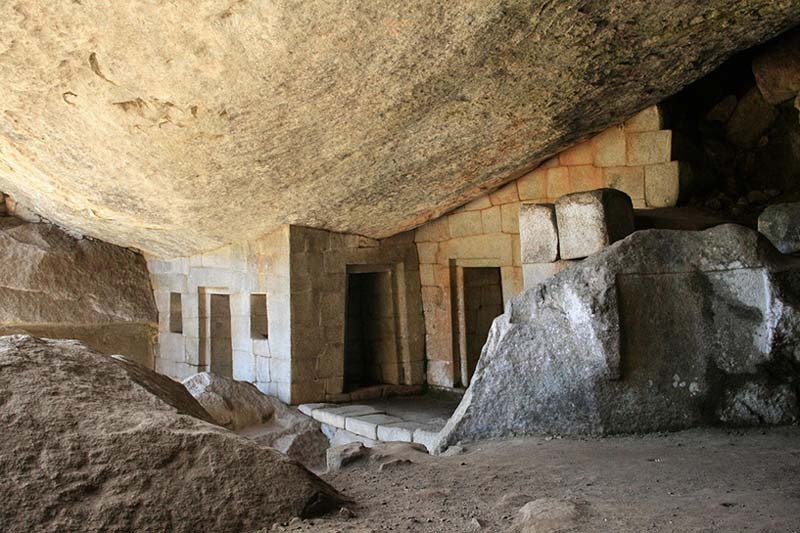 Characteristics: Construction in granitic stone inside a cave. Function: Its function is not yet defined. Visitors per day: 400 tourists per day. Reservation time: 2 or 3 months before. To visit the Temple of the Moon, you must purchase the Machu Picchu + Huayna Picchu ticket. In these hours you can visit the Temple of the Moon. Entrance to Machu Picchu from 7 a.m. Entrance to Machu Picchu from 8 a.m. In these hours you can not visit the Temple of the Moon. If you are going to visit the Temple of the Moon, start the descent from the top at 11:30 a.m. maximum. To visit La Gran Caverna you must purchase the Huayna Picchu Group 1 and Group 2 ticket. During the walk to the Temple of the Moon follow the signs. Do not leave the designated road or try to find roads on your own. Buy the Machu Picchu + Huayna Picchu entrance online 2 or 3 months in advance. If you are traveling with children, watch them closely. It is not allowed to enter tourists over 12 years. Older adults can do this walk as long as they have consulted with their doctors before. The only way to visit the Temple of the Moon is by buying the ticket Machu Picchu + Huayna Picchu. This ticket must be purchased 2 or 3 months in advance. Temple of the 3 Windows – This Inca building has 3 trapezoidal windows made with finely carved stones. The 3 windows would symbolize the tripartite worldview of the Incas: the division of the world into 3 dimensions, the 3 Inca laws, etc. Temple of the Sun – This religious temple of Machu Picchu was dedicated to the sun, the maximum Inca deity. It is located in the highest part of the religious sector, where the rays of the sun illuminate it. It is built on a cave and between carved stone walls. Temple of the Condor – Under the Temple of the Sun is a mysterious construction composed of 3 separate pieces. Each piece united and fixed from an angle supposes the figure of a condor, the sacred bird of the Incas. Main Temple – In the main square of Machu Picchu is this temple made of 3 polished rock walls. The main wall is deteriorated over the years. Inside there is a kind of altar where sacrifices would have been made. ← What to wear to visit Machu Picchu?